I love your dress!! Hope you feel better, colds are so boring! That dress is so cool I can't wait to see more!!! How amazing is that necklace! Lo ve your whole outfit, as usual, hope you feel better soon. i love that you will be featuring local artists! awesome! 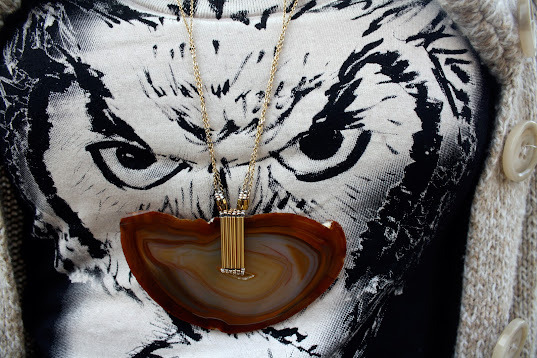 The owl totem and necklace are beautiful :) Feel better soon! The owl looks like a crazy screaming owl creature with the necklace over it's mouth. I love it! Man- I miss checking out LOLA stuff. Is Carla Hughes still involved? She's married to Dan Hughes who owns Sunflower. i love your dress! the owl print is so adorable. it made me think of hedwig (harry potter). love the tights too. I'm definitely excited to see more of the jewelry. That necklace is amazing! That's a pretty great dress alright. We are totally excited about this project! KANSAS! Thanks Katy!! 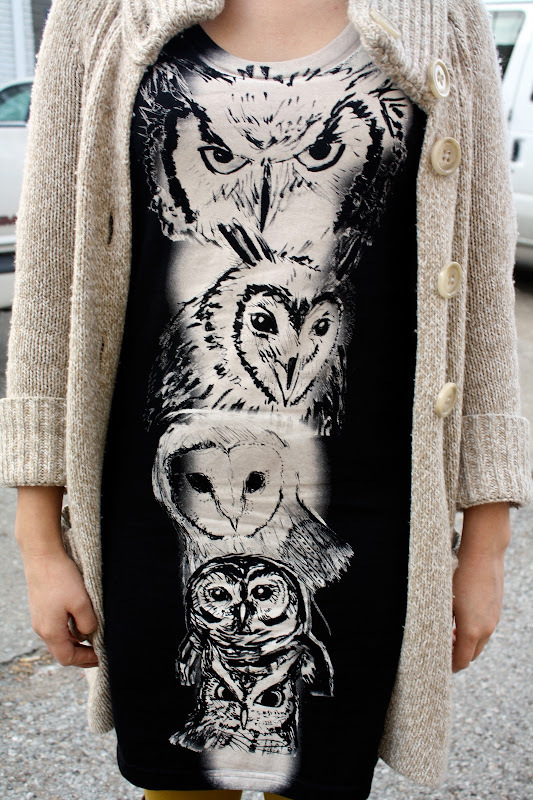 That owl print reminds me of the Labyrinth (my favorite movie, ever!)! Wow, what conversation pieces! Love them both! favorite outfit, hands down!! and thanks for the info on LOLA.. can't wait for it! That dress is just amazing...so whimsical and charming. Of course, I may be a bit biased, as owls are my fave birds. :) And I love how you rock the geode, too; I love chunky rock necklaces, but I often have trouble pulling them off myself. I wish I would have started following earlier! That would have been neat to go to! It's nice to see another midwest girl with some amazing style! Keep up the good work Katy. That dress and the necklace and great!! !